If you are a fan of chewy, fudge-like brownies, you’ll love this recipe. I did have to make this twice, to make sure I had the baking time right, but it was worth it. They are truly fabulous! Thick, chewy, rich! You won’t need any mixing bowls for this recipe, everything happens in the cast iron skillet. The only additional tools will be some measuring cups, a measuring spoon, a wooden spoon for stirring, and a rubber spatula. I developed this recipe myself. It’s adapted from one that I have always baked in a 13×9 baking pan, so I scaled it down a bit. If you have a favorite brownie recipe of your own, you can certainly use that and just watch the baking time. It’s also important to note that I used a 9 3/4″ cast iron skillet. If yours is larger or smaller, you’ll need to adjust the baking time a bit. You’ll also notice that my oven temperature is set to 325, rather than the standard 350 that most brownie recipes call for. That’s because these are fairly thick brownies and you don’t want to over bake the outside and under bake the insides. So instead, I decreased the temperature and increased the baking time. In fact, the picture of the individual slice above is from the first batch, which was a little underdone, BUT would be perfect warmed with ice cream. So on to the recipe, shall we?? Don’t they stick to the pan?? No, the seasoning from your cast iron skillet will keep the brownies from sticking. I suggest using an icing spatula to remove the wedges. Preheat the oven to 325 F. Place cast iron skillet on stovetop burner. Cut butter into 6 chunks and place in skillet with the chocolate. Cook over very low heat, stirring occasionally with a wooden spoon. Because the heat is low, it can take some time, so measure out your other ingredients while it's melting, so you aren't tempted to turn up the heat! 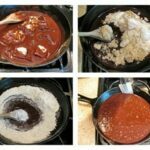 When the chocolate and butter are completely melted, remove pan from the heat and add both sugars. Stir until everything is combined. Add eggs, one at a time, stir well after each addition. Add flour and salt and stir until there are no traces of flour left. Use a rubber spatula around the edge of the pan to clean off the sides and get all the batter into the middle. Place skillet in the oven and bake for 50 minutes. Insert a toothpick into the center to test for doneness. Toothpick should come out clean, with the possibility of a couple of crumbs. If it's still wet, put back in the oven and bake at 5 minute intervals. Allow to cool on a wire rack for about 15 minutes. If you like warm brownies with ice cream and chocolate sauce (mmmmmmm! ), cut a wedge now. :) Otherwise, cool brownies completely before cutting into wedges. holy heck look at all of those comments! Go Amanda, GO Amanda! Love the brownie in the skillet! Regarding the brownie recipe. Did you write 15 sticks of butter? Or is that 1.5 sticks? Looks delicious! Making these brownies for the second time tonight, AMAZING and DELICIOUS recipe!!! Definitely recommend it to anyone thinking of trying it! Thanks so much Kat! I love these too, so glad you like them! 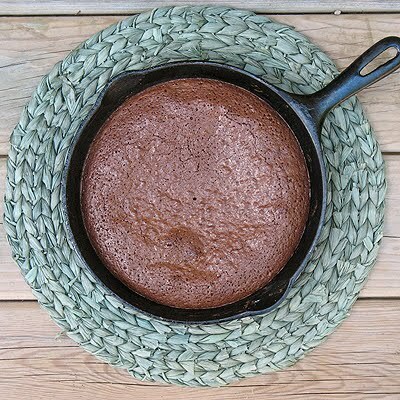 I just bought my first SQUARE cast iron skillet (the rest are various sizes of round) and I am initiating my new skillet with your brownie recipe! Thanks Amanda!! Yum! I just love brownies! I love anything that can be made in one dish. 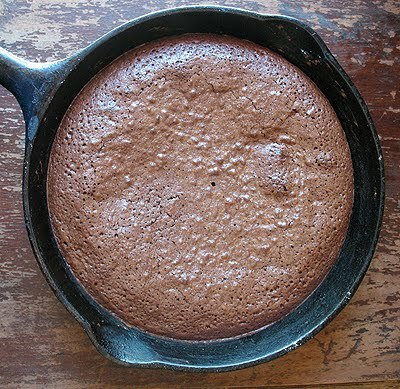 I have made plenty of thins in my cast iron skillet, but never brownies. Looks great!! Mmmmmm! Excellent use of a cast iron skillet! I am soooo loving that everything is done in a cast iron skillet! Oh great, now I have to clean the drool off my keyboard! 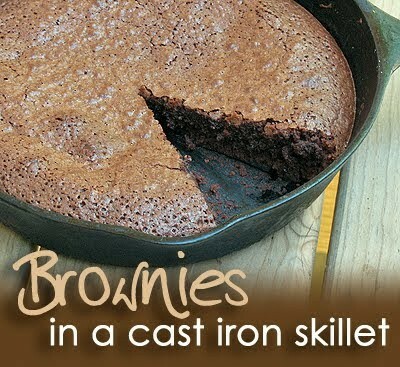 What a great idea to use a cast iron skillet. I love mine. I'm definitely going to try this one. Thanks so much for linking up to Finished for Friday. My husband is all about his cast iron skillet, so this is a great idea. Thanks for sharing with Craftastic Monday! Mmmm this looks good! I need a cast iron skillet, bad! I clearly need to invest in a cast iron skillet! Thanks for linking this yummy recipe up! cool! i once made a sweet potato pie in the skillet but that's because it was thanksgiving and the oven had broken! I need a skillet so I can make these! Those look fabulous Amanda! And I love that you can do them in the pan…no extra dishes! I will definitely give these a try. Ohh, I think I gained weight just looking at the pics! They look awesome. Thanks for commenting on my blog! Lori – oooooo hot caramel, mmm! 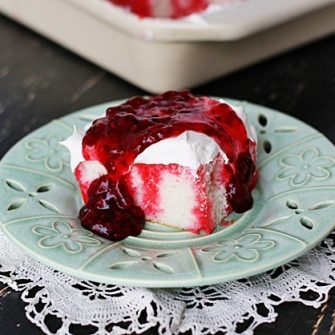 Made these for dessert tonight, and oh my word! So easy, and so very delicious. Every week my far-flung daughters and I share one recipe and we all make it for our families. I think I know what we'll be baking this week! These look delicious! What a great idea. Absolutely intriguing Amanda… you've held my attention with every word on the post! WOW!! Love the very idea! This is brilliant! I love the idea of the crisp crust around the outside of the pan. I love the rustic charm of using a cast iron skillet for cooking. My favorite is baking corn bread in one. Your brownies sound great! 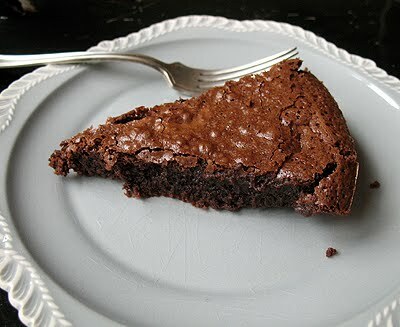 skillet brownies, what a wonderful recipe! I amazed at how much I have learned from other blogs…It truly incredible! Thanks so much for the great step by step photos! What a great idea. I just baked some cornbread in my cast iron skillet two nights ago. The family will get a kick out of this for sure!! What a great method of making delicious brownies! Very neat! What's not to love about a one pan brownie recipe! I love when I don't need four bowls to make dessert. Amazing idea and I love making stuff in my cast iron skillet. Super amazing idea. I love baking in the cast iron skillet. I never thought of doing dessert in one. Thanks for sharing your wonderful idea! I'm a big fan of making minimal dirty dishes, AND brownies are a huge favorite at my house. Looks like this recipe is going onto the "to try soon" list. Thanks for sharing! That sounds so uber delicious and in fact, your underdone one looks just *perfect* to me! Yumm! Going to send this to my SIL and see if she wants to try it out!! very cool ~ I have a cast iron skillet that I almost never use..not sure why, but I guess I will be dusting it off to make these! I bet that cast iron skillet makes such perfectly chewy edges. This is genius. Yum! Cooking it in a skillet is such a good idea! And these look delicous too! I have an iron skillet and two granddaughters here right now, we're going to bake these brownies. Thank-you for the recipe. this sounds awesome! that's a great idea Amanda, I love it. That tears it, I have to find me an iron skillet!! Those look fabulous! I love that you made EVERYTHING in the skillet! Brilliant! I love my cast-iron skillet, but have never thought of doing this. Looks wonderful! Great idea. I'll have to try it. I was just about to make some brownies with some fun mix-ins, wonder if I should try it in the skillet?? I think another good reason to use a lower temperature is because of the dark pan, you should always use 25 degrees less than a recipe says if your pan is dark. Yum. I might just have to go out and buy a cast iron skillet just so I can make these. They looks insanely good! 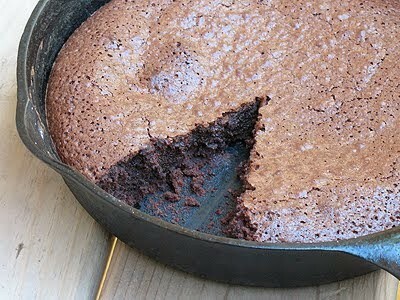 I love that you made brownies in a cast iron skillet. Beautiful.